NOVEMBER 2, 2017 – Ralph Epstein rose from modest roots in Malden to become one of the area’s leading pulmonologists and emergency room doctors. Epstein, who is now 78, was one of four children born to Ida and Hyman Epstein. 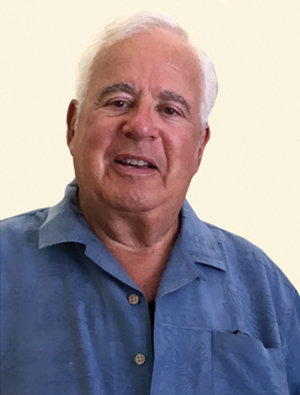 He won a scholarship to Williams College, studied medicine at Tufts Medical School, and practiced medicine for over 46 years in the Greater Boston area. Epstein and his wife Linda live in Danvers; he is the father of three children, two step-children, and has five grandchildren. He retired two years ago, and along with being an Uber driver for his grandsons, he is still active with the young men he has been a mentor for through KIPP Academy in Lynn since 2007. Tell me about your upbringing? I was born in Malden and I have a twin sister Ruthie. My older sister Sylvia passed away 15 years ago, and I have an older brother Arthur. I grew up surrounded by a loving and caring family that consisted of 24 aunts and uncles, lots of cousins, and many family celebrations. I learned early that the purpose of life is to make it easier for others – that was the message we absorbed from our parents and our culture. We had a tzedekah box. My mother and father had concern for the poor, and they always gave tzedakah. My father’s legacy is kindness and it greatly influenced me. My 15-year-old grandson Evan told me that the most important thing I have taught him is to be kind – kvelling! My dad was a pharmacist, but eventually went into business with his brother Harry. They ran a manufacturing company in Wakefield, making camouflage goods during WWII and paper goods after the war. He died when I was 13, and he was only 45. My mom was now left with the responsibility of four teenagers. She had been a stay-at-home-mom, but luckily her professional career as a lawyer served her well in the years ahead. She taught me perseverance, hard work, calmness and always told us that her children were her jewels. How was it to grow up in Malden? It was wonderful, because I had a large Jewish Community support system. It gave me something to fall back on when faced with occasional anti-Semitism. While walking to Hebrew school I was often picked on by kids just for being Jewish. So I had to run to school to avoid the kids who would hit us and taunt us. I was hit with a baseball bat by a kid a couple of times because I was a Jew. In high school I had many friends and many activities. I was privileged to be the class speaker at the Malden High School Class of 1957 graduation and the first student from Malden in 20 years to be accepted to Williams College. I relish the memories of those years. You began to work a lot as a teen? After my father died I began to work in the factory until my brother fired me. I guess I have to thank Arthur for my medical career. I went on to work as an orderly at Malden Hospital and then onto Mass General as a circulator in the operating room. (I picked up and cleaned the OR after surgeries.) I also worked during my teen years all through high school for my Uncle Sam who owned a dry cleaning business. We would deliver clothes all day Saturday and not get home until 11 at night. I had received a full scholarship to Williams, but I didn’t have $600 for board. So they offered me a job waiting on tables and I ended up with a total of five jobs at college in my four years. 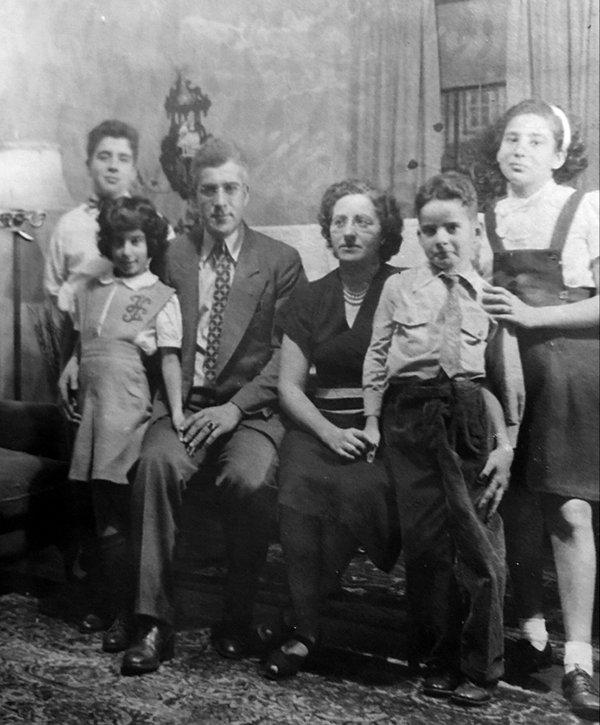 The Epstein family, 1947: Arthur and Ruthie on left; Hy and Ida seated; Ralph and Sylvia, at right. When did you decide you wanted to become a doctor? When I was five or six I knew I wanted to become a doctor. At that time I told my Aunt Helen that I was going to cure cancer. I used to tell people that I wanted to be an archeologist or a doctor, and I realized it was easier to spell doctor. After Williams I went to Tufts Medical School on a scholarship. I liked studying, I liked memorizing; I had “Sitzfleish” (ability to be still). I could sit for eight or nine hours and concentrate. I did my internship and residency at Boston City Hospital, and I went to the VA, and came back as a post doctorate fellow at City Hospital. After that I became the chief resident at the BU Pulmonary Program. During the Vietnam War I chose to enlist through the Berry Program, which allowed me to finish training as a pulmonologist before becoming active duty. I served at Madigan General Hospital in Tacoma, Washington. This was a 900-bed teaching hospital serving the 50,000 soldiers stationed at Fort Lewis. Madigan was a major base for Vietnam, with soldiers coming and going. It was an intense experience and privilege to serve active duty soldiers. Some of them had illnesses I had never seen before. Coupled with the opportunity to treat the dependents, these two years were deeply meaningful. I was honored to receive the US Army Commendation Medal for Meritorious Service. And, I left Madigan much wiser and so appreciative of our US Troops. I returned home and started the Reparatory Program at Lynn Hospital. I was fortunate to be joined in subsequent years by Dr. Jacob Karas, Dr. Bimel Jain, Dr. Jeffrey Newton, and Dr. Les Sebba. Together we established the “Lungevity Suite, The Chest Place in Town.” It had a well-deserved reputation for excellence and caring treatment of those afflicted with a variety of pulmonary ailments. As our office was on site in the hospital, we were able to see patients repeatedly throughout the day. We were in fact the forerunners of the hospitalist system. Coupled with our devoted therapists (called the lung rangers) we provided top-notch daily in-hospital care to many seriously ill patients. After 17 years as Chief of Respiratory Care, I resigned from my group to become an ER Physician. I was looking for more family time and loved the intense action that ER medicine offered. Prior to leaving I received the Physician of Excellence Award for the year 1989. 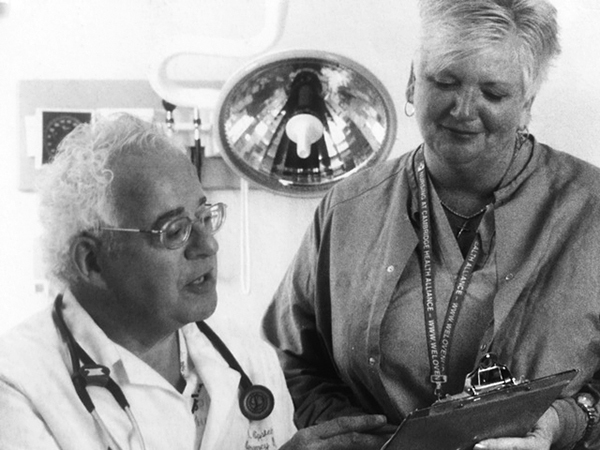 I first worked at Lynn Hospital and Union Hospital, and then I went to become the director at the Winthrop Hospital emergency room until it closed down in 1993. I then went to the Whidden Hospital in Everett from 1993 to 2008. Concurrently, I was also working in a variety of rehab facilities. In 2008 increasing back problems forced me to give up ER practice and focus entirely on my rehab practice. I retired two years ago at age 76. What did you like most about being a doctor? I loved the many challenges presented, often one after the other. What was needed? Knowledge? Empathy? Action? A loving touch or hug? “To make it easier for others.” That was the purpose of life. That is what I had been taught. And there I was. I was needed! I used all of my skills to diagnose each patient and respond to their needs. To quote Celsus from the 1st Century, “Medicine is a conjectural art – it has almost no rules.” For me, each patient was an individual and treated as such. Everyone was respected and treated with kindness. Every success fulfilled me. If success was not the outcome, I could offer comfort and understanding. My 47 years of practicing are remembered as a constant privilege. My boyhood dream fulfilled. To live your dream is to be blessed. I am blessed. Ralph is a wonderful person! Love to you!! Ralph , I think the last time i saw you you were 18, we lived across the street from one another on Lillian Rd. You are a handsome young man, with many, many accomplishments. I loved reading your story , i also read about Arthur in the Jewish Journel. I didn’t know about Sylvia so sorry. Regards to all. and enjoy your retirement. and generous in all respects. Medical school, for me not always a pleasure, was made nearly so in his presence and by his unwavering enthusiasm and inspiration. To this day he remains a dear friend and continues to have my profound affection and admiration. Ralph, Read the article on you and loved every word. You always were a mensch and always willing to be kind to everyone. I remember you as a young boy since we grew up as neighbors and attended the same schools. You and your family are part of my fondest memories growing up in Malden. Thank you for your friendship and kindness thru the years. I am blessed to know you. Proud of you for such a distinguished career. A true servant to your profession and the patients you treated. Ralpth, wonderful interview, including the references to your father who I knew when we were boy scouts and he was a scout leader. It has been a long time, and I was delighted to read where your career has taken you. One thing I do not understand: Why you retired? a lot more good times together. Words cannot express how grateful I am to have you in my life. The world is a better place because of you. Mazel tov on a life lived to the fullest. Mazel Tov, Dr. Epstein, although I always knew you as a resource: “better call Cousin Ralphie”, and a source of handmedown clothes in my youth . As a pulmonologist, you were a breath of fresh air, and as an ER physician, everyone to everybody. While you have been declared Honorable Menshcion, I’ve always known you win First Place in the Human Race. I could wax enthusiastic, but I’m not sure that this isn’t a tweet, and I may be running out of characters. you know, the world will never be out of characters with you running loose. Did I forget to mention that you have a WICKED sense of humor? Ralph, I don’t remember if you were voted most likely to succeed; but I think you have achieved more than anyone I know. It must feel rewarding knowing how many people you have helped in your lifetime. You are really remarkable. Gerry, thanks for sending this. I really enjoyed reading your story about being raised in Malden and all of your accomplishments. I am so proud of you. I love you and Linda. It was a pleasure to meet you at the Malden high school 60th reunion. So privileged to know my Mom graduated in such good company. Never lose your wit and charm! You are an inspiration to the to all that read your story. When the good Lord calls you will be ready to meet him.